Ray Blaine and Nick Atkinson are using the Cadence Virtuoso Suite of tools and the Assura Verification Suite to design reliable precision analog/mixed signal circuits for space environment applications. Ray and Nick have developed test circuits including: operational amplifiers, voltage references, and switched capacitor circuits. 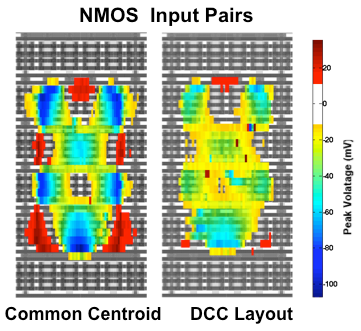 Ray and Nick have developed many novel implementations to improve the reliability of analog circuits in single-event environments. One area of significant improvement has been developed for differential input stages, where the resulting single-event transient output is eliminated or greatly reduced. Multiple publications are pending as a result of this research work.